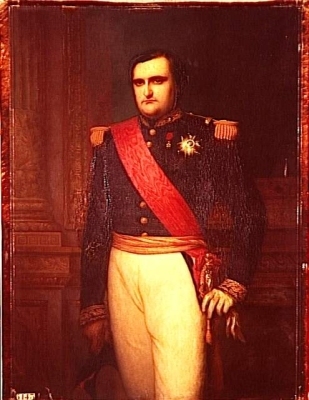 Napoléon Joseph Charles Paul Bonaparte, Comte de Moncalieri was born on 9 September 1822 at Trieste, ItalyG. He was the son of Jérôme Bonaparte, König von Westphalen and Friederike Katharine Sophie Dorothea Prinzessin von Württemberg.1 He married Maria Clothilde di Savoia-Carignano, Principessa di Savoia, daughter of Vittorio Emanuele II di Savoia-Carignano, Re di Sardegna and Adelheid Franziska Erzherzogin von Österreich, on 30 January 1859 at Turin, ItalyG. He died on 18 March 1891 at age 68 at Rome, ItalyG. Marcella Araminta Victoria Ross also went by the nick-name of Ella.4 From 1869, her married name became Linton.1 From 16 April 1879, her married name became Finch. After her marriage, Marcella Araminta Victoria Ross was styled as Countess of Aylesford on 13 January 1885. [S6] G.E. Cokayne; with Vicary Gibbs, H.A. Doubleday, Geoffrey H. White, Duncan Warrand and Lord Howard de Walden, editors, The Complete Peerage of England, Scotland, Ireland, Great Britain and the United Kingdom, Extant, Extinct or Dormant, new ed., 13 volumes in 14 (1910-1959; reprint in 6 volumes, Gloucester, U.K.: Alan Sutton Publishing, 2000), volume I, page 368. Hereinafter cited as The Complete Peerage. [S2] Peter W. Hammond, editor, The Complete Peerage or a History of the House of Lords and All its Members From the Earliest Times, Volume XIV: Addenda & Corrigenda (Stroud, Gloucestershire, U.K.: Sutton Publishing, 1998), page 54, says '1939'. Hereinafter cited as The Complete Peerage, Volume XIV. [S2] Peter W. Hammond, The Complete Peerage, Volume XIV, page 54. Rt. Rev. Harvey Goodwin held the office of Bishop of Carlisle. Hans Heribert Wilhelm Viet Adolf Graf zu Törring-Jettenbach was born on 25 December 1903 at Winhöring, GermanyG. He was the son of Hans Viet Graf zu Törring-Jettenbach and Sophie Adelheid Ludovika Maria Herzogin in Bayern. He married, firstly, Victoria Lindpaintner, daughter of Paul Lindpaintner and Maria Wegemann, on 19 October 1938 in a civil marriage. They were remarried in a religious ceremony the following day. He married, secondly, Maria Imakulata Baronin Waldbott von Bassenheim, daughter of Friedrich Heinrich Carl Maria Baron Waldbott von Bassenheim and Maria Alice Erzherzogin von Österreich, on 10 December 1947 at Oberalting-SeefeldG. He died on 16 March 1977 at age 73 at Murnau, Bayern, GermanyG. He gained the title of Graf zu Törring-Jettenbach. His marriage to Victoria Lindpaintner was annulled on 23 October 1947. Amadeo I di Savoia-Carignano, Rey de España was born on 30 May 1845 at Turin, ItalyG. He was the son of Vittorio Emanuele II di Savoia-Carignano, Re di Sardegna and Adelheid Franziska Erzherzogin von Österreich. He married, firstly, Maria Vittoria del Pozzo, Principessa della Cisterna, daughter of Carlo Emanuele del Pozzo, Duca della Cisterna e di Belriguardo and Countess Louise de Merode, on 30 May 1867 at Turin, ItalyG. He married, secondly, Marie Letitia Eugenie Catherine Adelaide Bonaparte, Princesse Napoléon, daughter of Napoléon Joseph Charles Paul Bonaparte, Comte de Moncalieri and Maria Clothilde di Savoia-Carignano, Principessa di Savoia, on 11 September 1888 at Turin, ItalyG. He died on 18 January 1890 at age 44 at Turin, ItalyG. [S16] Louda and MacLagan, Lines of Succession, table 72.